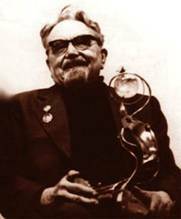 Aleksandr Kazanzev (1906-2002) Russia. The engineer. The writer. With 1956 — the international arbitrator on a chess composition, with 1975 — the international master. With 1951 on 1965 there was by the chairman of a commission on a chess composition of Chess federation a USSR. With 1926 has published 70 etudes, many of which are marked on competitions (8 first prizes). The participant 5 personal championships USSR.